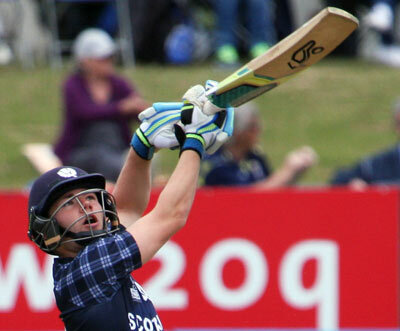 Matt Cross scored his maiden ODI hundred to lead Scotland to a hard-fought 31-run win over UAE in Dubai. The 25 year-old Aberdonian reached the milestone in his 35th match, striking 19 runs from the last over in making 107 not out. He thumped 10 fours and cleared the ropes twice in his 110 ball innings, sharing crucial stands with George Munsey (45), Safyaan Sharif (22) and Ali Evans. His heroics allowed Scotland to post 249 for 8 after they had been in trouble at 73 for 4 despite a solid opening stand of 42 between skipepr Kyle Coetzer (28) and Michael Jones (15). Richie Berrington and Calum MacLeod went cheaply but George Munsey went on the attack crashing 5 fours and 2 sixes in a rapid 45 from just 44 balls as he and Cross wrested back the initative in a stand of 59. Cross and Sharif continued the recovery with a stand of 54, while Ali Evans hung around in a 9th wicket stand of 41 in just 25 balls, with Cross utterly rampant to score what were to prove crucial runs. Ghulam Shabber looked as if he was going to lead the hosts to victory as he raced to 90 from just 83 balls (12 fours, 1 six) but from 142 for 3, UAE lost their way against a disciplined Scottish attack. Mark Watt (2-33), Stuart Whittingham (2-35), Ali Evans and Safyaan Sharif (both 2-48) all claimed a brace of wickets as UAE were dismissed for 208. The teams meet again on Thursday at the same venue in the final match of the Tri-Series. UAE 218 all out (46.3 overs; Ghulam Shabeer 90, Rohan Mustafa 20; M Watt 2-33, S Whittingham 2-35, A Evans 2-48, S Sharif 2-48).